Are you tired of the same old backyard that you've had for years? Are you ready to shake things up with new features, fresh accessories and one-of-a-kind design elements? Here are just a few things that will make your backyard pop! 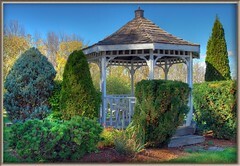 Gazebos are a great way to add a touch of elegance to your backyard. Not only can you build the gazebo itself with any kind of shape, size, material or feature that you desire, but once it's finished, you'll also have a blast decorating it! From paint to pillows, the design is all up to you. Try building a gazebo if you're looking for a creative backyard endeavor. When it comes to Jacksonville backyard water features, it's hard to beat the idea of a pool. Construct an elaborate infinity pool with steps, inclines and special water jets; inflate a simple above-ground pool for pets and kids; create something else entirely with a little water and a lot of imagination. Any kind of pool is a good pool, so don't be afraid to dream big. 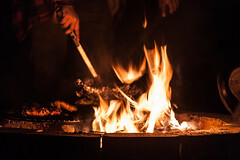 There's nothing like sitting around a fire on a chilly evening to warm you up inside and out. While the large, ceremonial fire pits can cost a pretty penny, there are numerous designs for smaller and more intimate ones that can be installed in any backyard. Just ask your local contractor or outdoor design company for help! Patios are both functional and fashionable, so you'll get a lot of mileage when you add one to your yard. Not only are they great architectural elements that can add thousands of dollars of property value when it's time to resell your home, but they'll also be highly convenient until then as a place to host parties and gatherings. Do you dream of a colorful, bountiful vegetable garden filled with fresh goodies of all shapes and sizes? Or maybe you'd prefer a quiet zen garden that you can treat as an oasis in the whirlwind of your life. Whatever your preferred aesthetic, every garden starts with a single flower, so grab your shovel and start digging. There are many more ways to breathe new life into your backyard, so don't be limited by this list. Use it for inspiration and come up with some great ideas of your own.